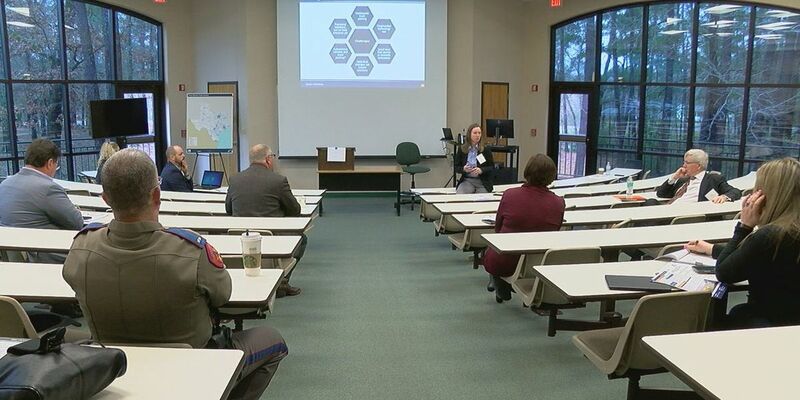 LUFKIN, TX (KTRE) - In efforts to identify challenges faced by roadway users and trucks, Lieutenant Eric Gray with The Texas Department Of Public Safety attended the statewide truck parking study workshop. "What we know is that when we have crashes involving truck tractors and smaller vehicles, the largest percentage of major vehicle injuries occurs with the smaller units,” Gray said. Topics discussed included freight infrastructure design considerations and truck parking challenges in urban and rural areas. "When you have trucks that don’t have a sufficient place to get off of the road and park, either due to hours of safety or hours of service compliance or due to mechanical issues or maybe even just some kind of minor emergency on their part, if they have to park in places to make it unsafe with vehicle traffic, then we end up with more of these crashes that we are talking about it,” Gray said. Alvin New, a Texas Transportation Commission Commissioner, was also in attendance, and he shared why conducting studies like these are beneficial. "Things that you hear in the different parts of the state are dependent on that parts of the states infrastructure needs, age of the infrastructure and also what’s important to the economy in that part of the state,” New said. DPS troopers say their priority is always safety and with data collected through the workshops they will be able to develop an action plan. “We talk about motor vehicle crashes. We talk about injuries. We talk about these things but a lot of times we think about, 'Well, we had a non-incapacitated injury, and that’s a good thing but non-incapacitated injuries and losing your car, all of those things are important to everyone,” Gray said. The truck parking study is expected to be completed in October of this year.